CM Magazine: The Sandwich Thief. Andr� Marois. Illustrated by Patrick Doyon. San Francisco, CA: Chronicle Books (Distributed in Canada by Raincoast Books), 2016. Mr. Geiger held out a burrito, soft and limp, that he must have bought from the store on the corner. Really unappetizing. If my parents had seen it, they would have accused him of possession and trafficking of junk food and taken him to court. �I had eggs for breakfast. I can wait. Excuse me.� I took note of the traces of yellow on his shirt collar. Then I left�with more questions than answers. Cafeteria food for breakfast? Store-bought snacks? Apparently, Mr. Geiger never took time to make himself a meal. That was a clue. He definitely had motive to steal someone else�s delicious meals. Plus, he was the principal. He made the rules. Now who was my prime suspect? The janitor who skulked around the halls or the principal who didn�t care about local crime and never had his own food? In this picture book translated from French, young elementary-school student Marin finds his sandwiches, artfully crafted by his foodie parents and featuring his mother�s homemade mayonnaise, missing from his lunch almost every day at school. His investigations of the mystery lead him to suspecting his classmates, his principal, a teacher, and the school janitor. When he finally tells his parents of his dilemma, his mother concocts awful-tasting �flavor balls� for a decoy sandwich, leading Marin to the horrified janitor Mr. Mars, discovered trying to rinse the horrible taste from his mouth and led away by the principal. 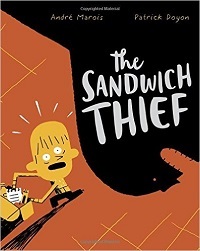 A lightly ironic, sardonic, almost post-modern picture book that could double as an early reader, The Sandwich Thief employs sparse, casual language with dry, deadpan wit and a foodie�s discerning taste, praising gourmet creations and turning down its nose at packaged and fast food. The illustrations are of the pseudo-childish type, combining rough line drawings with splashes of a very limited colour palette in the orange-and-black range. The text is handwritten, occasionally in full paragraphs, often with several frames per page, with dialogue in text bubbles (rendered in quotations in the excerpt above for clarity), giving it an appealing comic-book format and sensibility. With very little in the way of a dramatic arc, the story meanders a bit, most engaging when Marin enumerates his top suspects, less so when he pesters the principal (also a suspect) to help solve the mystery. The translation seems fairly natural but hits an unexpected snag when Marin�s class is conjugating the verb �to have� (unlikely in an English-language curriculum). When Mr. Mars is revealed as the culprit, it is less than satisfying: the janitor is neither an unexpected nor an obvious perpetrator. The �flavor balls� are at first confusing, their contents being the only detail kept from the reader, but when their flavors are revealed (dirt, tar, cat pee, etc) and Mr. Mars confesses it was the homemade mayonnaise that made him steal the sandwiches, there is at last some bizarre logic to the resolution. Occasionally too casual for its own good, this quirky story has a light touch that deserves a place on early-grade shelves. Todd Kyle is the CEO of the Newmarket Public Library in Ontario and President of the Ontario Library Association.